This unique and exclusive family villa, 'Lava Villa', was constructed in 1998 with volcanic rock. Built in the foothills, it is situated on one acre of private land with its own swimming pool (6.7m x 4.6m/22' x 15'). It's in an exclusive area of the island with spectacular views of the Natural Park, the sea, and Lanzarote. Lava Villa's master bedroom is en-suite with a bath/shower; and there's a separate shower. A safe is provided for your valuables. The second and third bedrooms (twin-rooms) have a separate entrance off the courtyard, and share a fully-fitted bathroom. All bed linens are supplied in Lava Villa. The kitchen is fully equipped. Thanks for the hospitality - a great place to be based for exploring the island. We had a very nice stay at the very clean and comfy lava villa, located in one of the best area on the island. We had the great pleasure to meet Frank and his wife who were super friendly and helpful, thanks to them! We loved the place so much that we started looking for a house on sale next to Frank's villa! We chose Villa Lava for it’s location of tranquility and we were certainly not disappointed -with stunning views of Corralejo beaches and across to Lanzarote , open aspect and private garden with only bird song to relax in. There’s also the added bonus of it’s sheltered courtyard, if it’s windy. The location is ideal as there are lots of stunning beaches to visit within a short drive. 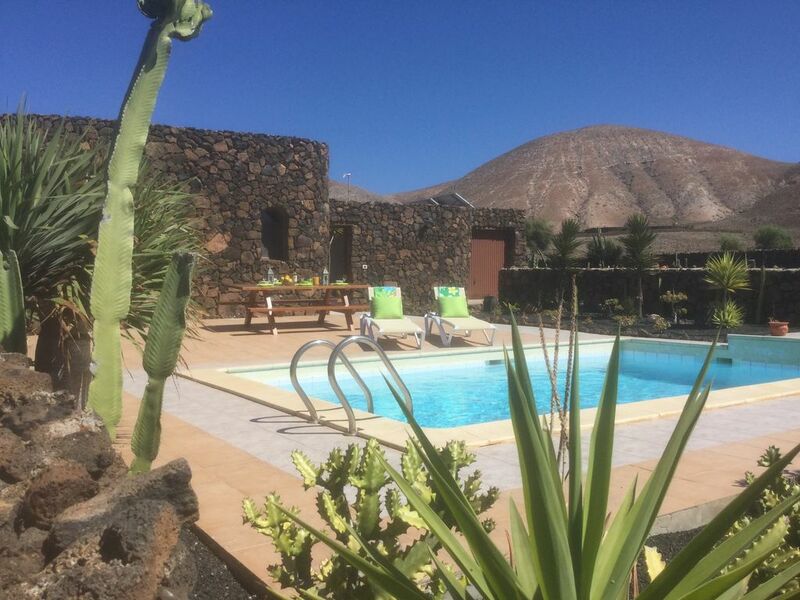 The whole experience was made easier with the helpfulness of the hosts Frank and Maria Lynch, who I contacted with a few questions before booking, and were extremely accommodating and communicative. . Our first visit to Fuerteventura and Villa Lava and would highly recommend both. Thank you Frank and Maria for being excellent hosts. Spotlessly clean and well equipped home that we didn’t want to leave!! The villa was comfortable and a real chill out. The area was peaceful with perfect evenings in the courtyard under the stars. The owner was most helpful and made our time there total relaxation. No problems and can’t wait to go back. Linda & John. My girlfriend and I enjoyed a fabulous break at Lava Villa, which is set amid beautiful surroundings. We loved popping into nearby Villaverde each evening for a delicious meal. All of the restaurants in the village were superb. The villa is very well equipped with a fantastic walled courtyard - perfect for pre-dinner drinks and games of cards! We would definitely visit again. Set among a cactus garden away from the madding crowds, Lava Villa was everything we hoped for and more. The kids enjoyed the pool and we got to relax away from the main tourist drag. Shops and restaurants are 10mins away with main beaches, surfing or nightlife 20mins away. You will definitely need a car but the up side of this is to have total tranquillity when at home. There are about 10 other lava rock houses in the vicinity, which blend in well with the views. Even got to read a book for the first time in ages! Thanks for a fab holiday. Visiting the villa is like taking a step back in time as it is built in traditional Canarian style but yet has all the modern conveniences. Part of its uniqueness is the fact that it is completely powered by solar energy which allows the views to remain unspoilt by telegraph poles and pylons. Holidaying here you feel totally in tune with nature. On opening the door to the villa you enter an enclosed courtyard and colourful garden. The courtyard is terraced and the doors to the various rooms lead off the terrace. The villa boasts three generous sized bedrooms, two bathrooms, a fully fitted modern kitchen, a large lounge/dining area and a garage for all your surfing equipment. All rooms have rustic timber beams on the ceilings and the Master Bedroom is en-suite. The enclosed courtyard allows you to sunbathe in complete isolation and is the perfect place for children to play safely. The only sounds you will hear as you relax will be the clink clank of goat bells as they graze in the hills. Sterling Pound - Rates Available on Request Email owner.